Chicago area producers get ready. 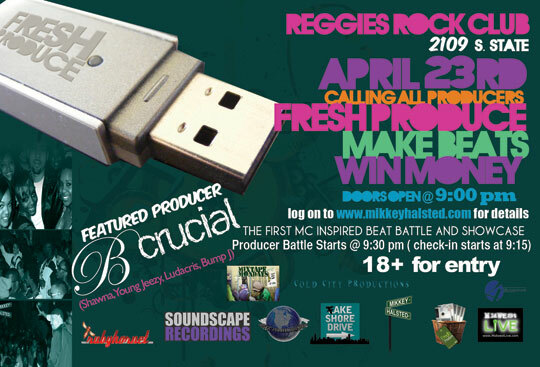 Mikkey Halsted presents the Fresh Produce Beat Battle, which will take place Friday, April 23rd at Reggie’s Rock Club. The crowd judged producer beat battle will feature a showcase with producer B-Crucial and will be hosted by NoTryDo, SINCERE, and Que Billah. Visit visit Mikkey Halsted for registration details and additional information. I’m bout to hit this one up and rep for CK. Im bout to take some ones head off. I got a few free tixs for any of the CK crew from the Chi that want to come thru and show love. Please email me any event information on the next producer beat battle or showcase. Thanks!